Posted on November 14, 2012	by Platanos, Mangoes and Me! I’ve been a bit busy after Hurricaine Sandy that I almost did not make this post. This month’s challenge from 5 Star Makeover Cooking Group is to reinvent the string bean casserole which quite honestly was never served in our home. For the string beans: about 15 each yellow waxed and green beans trimmed. Place them in a pot with salted water and cook until tender. Drain and set aside. 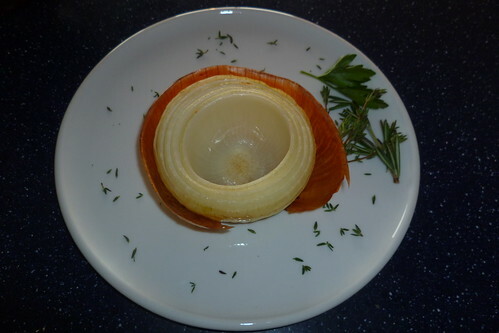 Onion bowl: Take a large onion and cut in half removing skin, but leave some on, bake with a few teaspoons of olive oil for about 1 hour then remove center leaving a shell. Mushroom sauce: 3 tablespoons of olive oil and 1 teaspoon of black truffle oil. 2 shallots cut lengthwise, 2 garlic cloves minced, 6 oyster and 6 shitake mushrooms chopped. 1 sprig rosemary, 2 sprigs thyme, 3-1/2-4 oz crème fraiche fror yogurt. In a pan heat olive oil, add shallots and garlic. Once the shallots are translucent add mushroom and truffle oil until mushrooms are soft then add crème fraiche and heat through. Assemble by placing half of the string beans in each onion cavity, then mushroom mixture and finish off with nuts and fresh cranberries. 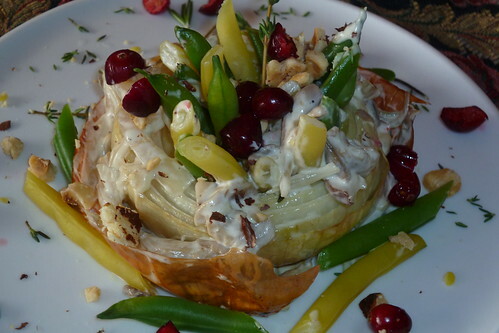 This entry was posted in Appetizers, My recipes, Something Different, String beans, Uncategorized, Vegetarian. Bookmark the permalink. This is very creative and attractive to look at too. Looks like a colorful flower pot sitting in the garden. Well done! I love it! It looks amazing…I would like your take on it, anyday! So unique. I would never have thought of this. I have to get busy. Very creative. Your dish is really beautiful! I love the idea of that onion bowl! This is one prettiest onion recipe I have ever seen! Creo que Sandy es uno de los peores que les pudo tocar, espero todo haya estado bien contigo y tu familia. Recibe muchos cariños. Wow! Definitely NOT my mama’s string beans, indeed. Looks and sounds delicious! Very original! This dish looks fabulous. Such a fantastic makeover – very elegant. I love stuffed food bowls and this looks and sounds delicious! Looking forward to seeing you soon! Stay well and love to P & everyone else. I choose your casserole, hands down! Love it! Wow. You and Joan both blow me away with your creativity. 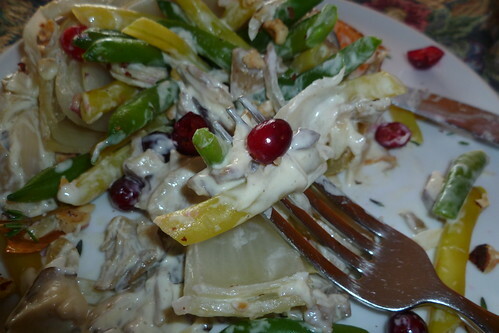 You should see my poor green bean casserole, healthily updated and delicious, but not very pretty. This is just wonderful! Holy cow! 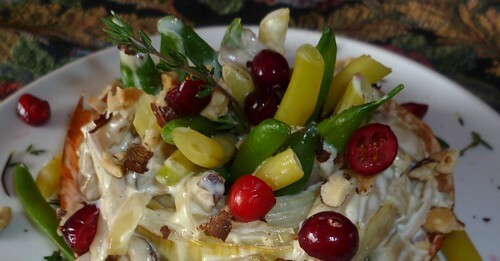 I’d eat this version of string bean casserole any day! I do like the traditional version, but I haven’t made it since moving to Argentina (can’t get the ingredients here). Maybe next year I’ll try yours! 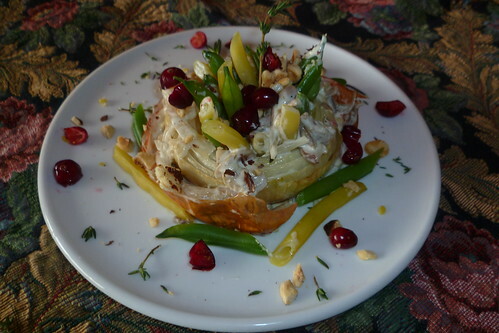 The onion bowl idea is so neat and I love the festive look of the dish with cranberries! Way to rock the makeover Norma! A riot of color and flavor, with a creative onion bowl. Super-festive! I love your version, Norma! How fun…I just love the idea of an onion bowl! This will be perfect for the holidays!